This year at Yarn Expo Spring, 468 exhibitors from 12 countries and regions welcomed 28,302 visitors, representing a 9% increase. The fair covered 26,000 sqm at the National Exhibition and Convention Centre (Shanghai), with new exhibiting countries including Egypt and France. Yarn Expo has established itself as a leading networking destination for worldwide visitors and exhibitors, with a wide variety of products on offer, according to organisers. Most notably, there was onsite evidence of ever-shifting sourcing trends from around the world. “Yarn Expo Spring’s strength lies in its diversity of products and innovations. It’s undeniable that this is attracting trade buyers from throughout the supply chain,” said Wendy Wen, Senior General Manager of Messe Frankfurt (HK). The fair welcomed buyers from well-known brands such as Fila, Guess, Ralph Lauren, Jack Jones and Vero Moda, as well as Adastria, Itochu, Li-Ning, Maracaibo, s.Oliver and a buyer delegation from Korea. Brands like Sankom, who were searching for a unique functional fibre, are increasingly visiting Yarn Expo to meet their specific sourcing needs. Whether that’s in order to source the particular yarns or fibres needed to maximise efficiency or sustainability, it’s evident that Yarn Expo Spring provides plenty of options to make end-use products stand out from the crowd, organisers add. 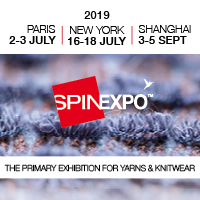 “The most important benefit for us being at Yarn Expo is the customer connection and to see what is new in terms of innovation. We leverage this platform for our own innovation campaign and marketing story. We have a wide range of customers – we see the entire chain up to the consumer as our customers, so we have a lot of brands from Hong Kong, Europe and the US coming here to meet us. You can always find what’s new at Yarn Expo,” commented Manohar Samuel, Senior President, Marketing & Business Development, Grasim Industries, Birla, India. Visitors were also left satisfied with the products and services on offer. “Right now, the most popular product with our clients is recycled yarn and merino wool – a lot of fashion brands are asking for this. Our company has been visiting Yarn Expo every year for a long time, for the variety of products, manufacturers and internationality of suppliers,” commented Michał Bonusiak, Product Manager, Legs Sp. Z o.oo, Poland. Yarn Expo Spring 2019 was held concurrently with Intertextile Shanghai Apparel Fabrics – Spring Edition, Intertextile Shanghai Home Textiles – Spring Edition, PH Value and the China International Fashion Fair (CHIC). The next Yarn Expo fair, the Autumn Edition, will be held at the earlier date from 25-27 September 2019, once again at the National Exhibition and Convention Center.